Set during the Sierra Leone Civil War in 1992-2002, the film shows a country torn apart by the struggle between government soldiers and rebel forces. It also portrays many of the atrocities of that war, including the rebels' amputation of people's hands to discourage them from voting in upcoming elections. The film's ending, in which a conference is held concerning blood diamonds, is in reference to an actual meeting that took place in Kimberley, South Africa in 2000 and led to the Kimberley Process Certification Scheme, which seeks to certify the origin of rough diamonds in order to curb the trade in conflict diamonds. The film received mixed but generally favourable reviews. The story of the bird-egg sized pinkish rough diamond found by Djimon Hounsou in the movie may be inspired by one of De Beers' most celebrated and priceless diamonds, the flawless D-colour 200 carats (40 g) Millennium Star. It was discovered in the Democratic Republic of Congo (Zaire) and sold to De Beers during the height of the Civil War that took place in the early to mid-nineties. The extremely rare stone had the magic weight of 777 carats and it took three years for a team of world's leading experts at Steinmetz to cut from it the 203.04 carat pear shaped diamond. 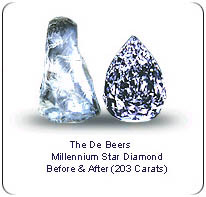 Nicky Oppenheimer, DeBeers Chairman, was careful not to put a value on the Millennium Star, saying that any figure he would give would be purely academic. However, he did insure the Star for 100 million pounds, but this is believed to be a fraction of its true worth. The previous record price paid for any polished diamond was $16.5 million for a 100.10 carat stone, the Star of the Seasons, that was auctioned by Sotheby's in 1995, thus selling for about $165,000 per carat. Diamond's are a girls best friends - but stones like this make human life cheap. It is the genuine and rough acting by Djimon Hounsou that makes the difference for Blood Diamond. Leonardo DiCaprio, of course, gives this remarkable movie stardom. He is so Titanic, however, that I could not avoid comparing the other star, Jennifer Connelly, with Kate Winslet even I tried very hard not to. Rarely have I learned from a movie so much about current issues in our world today as from Blood Diamond. After seeing it, I find that reading about the reality of blood diamonds from the wikipedia article and elsewhere I can actually understand and visualize the things described there. 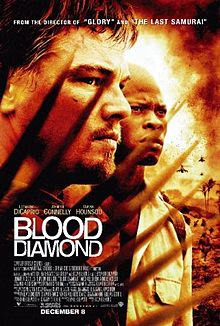 Blood Diamond film is quite an eye opener to the darker side of modern history of Sierra Leone and other West African states in turmoil. Especially powerful is the description of the tragic world of child soldiers so intimately by focusing on the relationship between a father and his brain-washed son. I am just afraid that the scene from the rehabilitation centre where some of the boys were sitting without hand was taken in some real place with real war victims. At least the film looked like a documentary at that point. 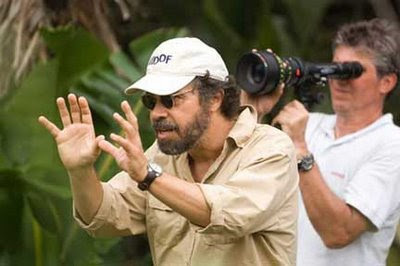 Director Edward Zwick succeeded here in using the media of cinematography to pass a significant message. I am not surprised if this movie has influenced and still has impact on political decision makers dealing with modern diamond industry and conflict stones. Edward M. Zwick (born October 8, 1952) is an American filmmaker and film producer noted for his epic films about social and racial issues. He has been described as a "throwback to an earlier era, an extremely cerebral director whose movies consistently feature fully rounded characters, difficult moral issues, and plots that thrive on the ambiguity of authority."